IV Dominican Republic Environmental Film Festival (DREFF). September 10-14, 2014. We celebrated our 4th Golf Tournament with the participation of over 70 players that gathered to play in the prestigious Biltmore Hotel in Coral Gables, Miami, Florida. Leading figures from the philanthropic field, prominent sports figures and other GFDD friends and supporters came together to play golf while continue to foster our social, economic, democratic and cultural programs and initiatives in the Dominican Republic and throughout the Western Hemisphere. Former President of the Dominican Republic and President of GFDD Dr. Leonel Fernández attended the event. The 65th Annual United Nations Department of Public Information/Non-Governmental Organization (DPI/NGO) Conference was celebrated August 28-29, 2014. GFDD actively participated co-sponsoring with Fundación Global Democracia y Desarrollo (FUNGLODE) a panel discussion and workshop organized by the United Nations Association of the U.S.A. (UNA-USA) Council of Organizations. The event was held in the Trusteeship Chamber and focused on a trending public health topic: “Antibiotic Resistance and Obsolescence: Meeting the Major Infectious Disease Challenge for Post-2015”. Main arguments discussed included the urgency for new global health initiatives based on public-private and North-South partnering on this post-2015 sustainable development agenda. GFDD met Emely Grisanty, a Dominican artist with great passion and an impressive theatrical talent. A short video presented by DominicanaOnline allows you to know her better and take a peek of her gift. The portal www.DominicanaOnline.org is a GFDD initiative created with the purpose of presenting the country with a wealth of current information to a national and international public, promoting the image of the Dominican Republic, disseminating knowledge about the country and strengthening the appreciation and respect for its heritage and values. During our July’s Global Roundtable, GFDD’s Executive Director, Ms. Natasha Despotovic, sat down with Ms. Christine Hart, Manager of Policy and Government Affairs at Women Thrive Worldwide, to speak about the role of gender equality and the issue of sexual violence against women within the post-2015 development agenda, with emphasis on the success of their advocacy efforts in the Caribbean and the USA in particular. During the discussion, Ms. Hart commented on the different efforts Women Thrive Worldwide and other institutions perform to contribute to promote gender equality, such as those from UN Trust Fund to End Violence against Women. 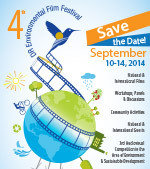 The IV Dominican Republic Environmental Film Festival (DREFF) will take place in Dominican Republic on September 10-14, 2014. The DREFF is an initiative of the Fundación Global Democracia y Desarrollo (FUNGLODE) and its sister organization in the United States Global Foundation for Democracy and Development (GFDD). Since 2011, the DREFF has brought together a diverse selection of high quality films that deal with pressing environmental issues, with the goal of raising awareness and deepening the understanding of environmental issues among Dominican audiences. The DREFF has served as a catalyst for projects and programs that promote responsible environmental practices as the result of interaction between young people, the general public, teachers, experts, activists, filmmakers and leaders in the public & private sector. Screening sites this year include Santo Domingo, Santiago de los Caballeros, Puerto Plata, La Vega, San Francisco de Macorís, Baní, Sosúa, Samaná, San Juan de la Maguana y San Cristóbal. Where: Several venues, Dominican Republic. GFDD’s initiative InteRDom will host the next Global Dominican Academic Exchange Program at the University of Pennsylvania. Dominican undergraduate students from all study areas will participate in this exciting exchange experience, which will take place from September 22-27, 2014 in Philadelphia, Pennsylvania. Participants will be paired with a student member of the Grupo Quisqueyano, the Dominican student organization on the UPenn campus, with whom they will be lodged, attend classes and participate in an agenda of activities scheduled by the student hosts to go along with the theme Exploring Our History and Moving Forward. The event has been strategically scheduled during the United States’ Hispanic Heritage Month so that it will coincide with activities and speakers representing and celebrating other Latino cultures. Where: University of Pennsylvania, Philadelphia. GFDD will actively participate at this UN Climate Summit as part of its efforts to contribute on enhancing awareness on climate change issues around the world. “Climate change is not a far-off problem. It is happening now and is having very real consequences on people’s lives; it is disrupting national economies, costing us dearly today and even more tomorrow. But there is a growing recognition that affordable, scalable solutions are available now that will enable us all to leapfrog to cleaner, more resilient economies”. The UN Climate Summit 2014 is going to be held September 23rd, 2014. It provides a unique opportunity for leaders to champion an ambitious vision, anchored in action that will enable a meaningful global agreement in 2015. Where: UN Headquarters, New York. The 8th Dominican Book Fair in New York will take place September 26-28, 2014. This year the Fair is dedicated to Rei Berroa, a renowned Dominican writer and professor living in the United States who has published more than 40 works. The Fair is an important event organized by the United States Cultural Commission and promoted by the Ministry of Culture of Dominican Republic. GFDD will participate in this Fair with several activities including launching publications, screenings of Dominican short films, recycled art workshops and a photography exposition. Our next golf tournament will be celebrated at the Fresh Meadow Country Club in Long Island, on September 29th, 2014. This activity is part of GFDD’s aim to share with its supporters while promoting fundraising efforts to be able to continue implementing valuable research, enhancing public understanding, designing public policies, devising strategies and offering capacity building in areas crucial to social, economic, democratic and cultural sustainable development in the Dominican Republic and Western Hemisphere. Where: Fresh Meadow Country Club, Long Island, NY. Where: 151 Broadway, Suite 200. Providence, Rhode Island. 02903. Where: UGA School of Law. Athens, Georgia, United States. GFDD is a non-profit, non-partisan organization dedicated to the advancement of global collaboration and exchange relevant to Dominican professionals, general audiences and institutions in the homeland and abroad. The Foundation conducts research, enhances public understanding, designs public policies, devises strategies, and offers capacity building in areas crucial to social, economic, democratic and cultural sustainable development. We are able to continue our valuable work, thanks to the support and generosity of our donors, institutions and individuals aiming to contribute to the continuity of our initiatives and activities. We welcome all levels of contribution, whether it's a one time gift, monthly donation, or in kind. Donate here! GFDD actively participating in meetings, seminars and events in Washington, D.C. regarding current discussions on democracy and international development global trends. Topics such as innovations for development, climate change and its impact and global trade where part of the subjects of some of the dialogues and debates that GFDD has joined, hosted by entities such as The Brookings Institute, Society for International Development (SID), Organization for the American States (OAS), Center for Global Development (CGDEV), and the Center for Strategic & International Studies (CSIS). These efforts are part of our institution’s aim to identify the most important lessons learned and best practices on these matters for the Dominican Republic.